Having a talented and technical team of professionals, we aim to provide high quality and cost-effective digital experience to our clients. Through our personalized web and app solutions, our clients get a competitive edge in this highly competitive IT industry. Here at Yexaa, we maximize our creativity and deliver better and faster results than any other ordinary digital agency. We ensure meeting the clients’ expectations, following a highly professional work environment. No matter from which domain or genre your business belongs to, we will come up with personalized and innovative solutions for you. Yexaa is a fully equipped vendor that undertakes the development of web applications for the starters in various businesses and those developing their activities in line with the new technology. We are here to enhance your digital existence by providing you high-quality web development services for a better digital life. Your customers want to make connections with you online and we can help you make these connections stronger and beneficial for you. Having a team of real web application developers, we design user-engaging and search engine friendly websites for our clients from India, U.S.A, U.K, Australia, Canada, and different other countries. Our team is well-educated and trained in creating all kinds of web applications including React, Angular, DotNet, Java, Devops, Python and others. Having a wide range of IT services from India, we also provide cost-effective mobile application development services to both big and small organizations. We can cover your business through our extensive experience in mobile app development. Moreover, we can develop user-friendly apps for both mobiles and tablets. Here at Yexaa, we offer you our valued application development and management services for all the mobile platforms including Andriod, OS, iOS, Windows, and others. We have more satisfied clients than other mobile application developers because we offer personalized and custom mobile application development. We consider each of our clients as a special one and provide him with the best experience, relevant to his business model and its needs. From bugs to Scaling, we provide complete web and app maintenance service and deliver you a completely safe and secured online space. Since great products need timely maintenance and support, you must make use of our service to keep your website, application, or software beware of all kind of security threats. The landscape of technologies changes within some days so you also need a web and app maintenance service to bring timely changes in the design, content, or structure. 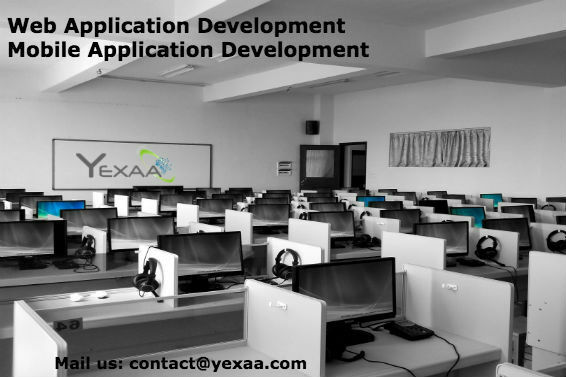 In case you want to enhance your application, Yexaa can be an ideal platform for you as we have got some of the most highly experienced and dedicated application development experts who have worked for plenty of international entities. Contact us now with your queries at [email protected] We have better solutions for your needs! our scope of services entail the entire application development cycle, ranging from the design and development of necessities to the maintenance of the product and then governance of business processes. We ensure that our offerings are of high quality, secure and easy to maintain. Yexaa has coordinated with starters and small firms only since its inception. We have established a customized workflow that is essential for effective and impactful cooperation to lower the costs and escalate reliability. Yexaa balances business requirements and technology. We lay more emphasis on the enterprise and experience to offer quantifiable outcomes. Through our experience in the industry plus technical skills, we create exclusive solutions and offer actual value to customers. We also help institutions to stay on top of their competitors through effective management of their web apps portfolios.